a couple of bondas plus a cup of coffee or tea equal to bliss. A perfect dish on a rainy day! here is the recipe. Cook the potatoes. Peel off the skin. Mash well and keep it aside. Chop the onions and green chilllis very finely. Peel off the skin from the ginger and chop finely. Heat a tablespoon oil in a kadai. Add the mustard seeds, when it pops, add the urud dal, green, chillis, ginger and onion. Saute until the onions are soft. Now, add the turmeric powder, asafoetida powder, salt, chopped coriander leaves and mashed potaotes and mix well in low heat. DO NOT ADD WATER. Keep stirring until equal distribution of spices. Keep it aside and allow it to cool. When it's luke warm, make small balls and arrange in a plate. The filling is ready to be dipped in batter and deep fried. Take a mixing bowl and mix in the besan flour, rice flour, salt, turmeric and red chilli powders and soda if your are adding. Whisk it dry and then add water little by little while stirring continuously. Make sure the batter is thick (thicker than the bajji batter) and there are no lumps. The batter is ready too. Heat oil in a kadai. Test by frying a drop of the prepared batter. The fried batter should come to the surface frizzing. Hold the mixing bowl near the oil, take a prepared potato ball, dip it in the batter and glide it in the bowl corner to prevent dripping and then slide it gently into the hot oil. You can fry 3 to 4 bondas in each batch. Make sure the oil in in medium heat. 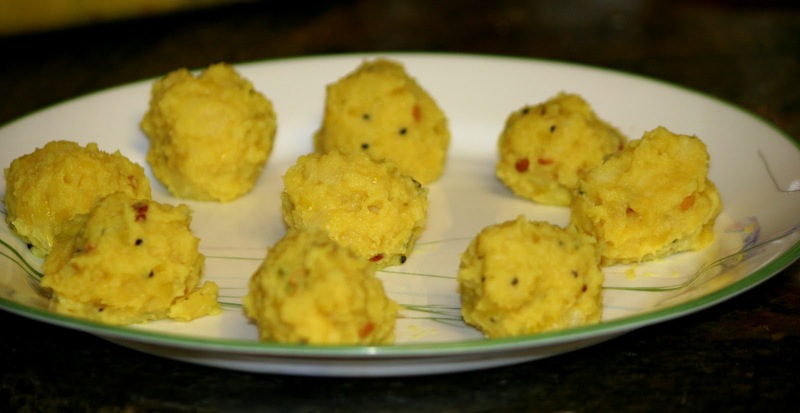 With utmost caution, keep tossing the bondas so that it is fried well on all directions. When the bondas turn a little darker than golden brown, take the bondas out carefully and place them in a paper towel lined bowl. Serve the hot bondas with chutney of your choice. When serving for children keep in mind the filling will be super hot. I did not prepare any chutney and I served it with masala chatpat maggie sauce. Aloo bondas look super yummy. 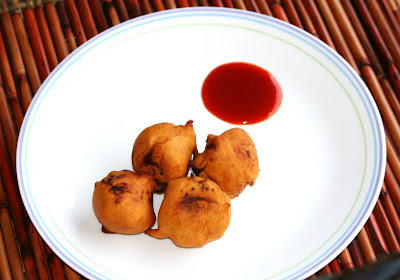 Oh I am so craving a bonda now.. this cold weather is perfect for them.. pass me some? Wonderful bonda. Love to have it with Tea. Hi, it looks like you have managed to capture the right mix of flavour, aroma and taste for your yummy bondas! Given today’s lifestyles, the right way to great health is by eating healthy homemade foods and avoiding unhealthy snacks. Check out our blog at http://knorratseven.blogspot.com/ for expert tips on healthy eating habits.